What is a “preset”? Behind this term lies all the magic and efficacity of DxO OpticsPro’s automation. Did you know that as soon as you open an image, the program automatically applies a preset called DxO Standard? 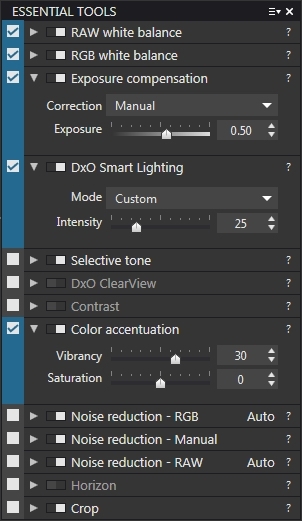 This preset contains a certain number of basic corrections that are adapted to each image, taking into account the characteristics of the camera/lens combination (analyzed in DxO’s laboratories). The DxO Standard preset corrects the tone (exposure as well as optimization of the dynamic range), the colors (application of the camera default rendering and protection of saturated colors), noise, and optical corrections as well (distortion, vignetting, chromatic aberrations, sharpness optimization). The entire process is automatic — as soon as your images are displayed in the image browser, you have nothing more that you must do! Of course, DxO OpticsPro 10 lets you create custom presets, and you can also substitute whatever preset you want for the DxO Standard preset. There are two kinds of presets: full presets, which give you a collection of corrections to use as a base from which to work; and partial presets, which let you correct a particular aspect of your image, without affecting the other aspects. In this tutorial, we will first discuss the visual presets interface and how to apply the presets, and then we will explain how to create a custom preset. To finish (the “going further” section), we will let you know how you can replace the DxO Standard default preset with a more neutral preset or a custom preset. If the general idea of presets has not changed in DxO OpticsPro version 10 with respect to the previous version, there have nonetheless been a certain number of improvements to the ergonomics and to the file loading speed, as well as the fact that the Designer presets from DxO FilmPack 5 have been integrated (if you have DxO FilmPack 5 installed on your computer). When you click on the Apply preset button in the upper right corner of the Organize or Customize tabs, a large floating window appears. General presets: Contains 4 basic presets (DxO Standard, Neutral Colors, Black & White, and No Correction). 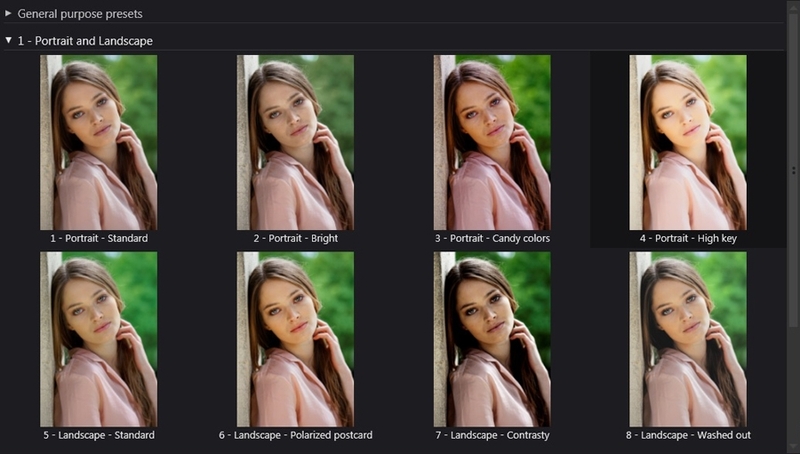 Portrait and landscape: Contains 8 presets, in other words 4 variations optimized for each theme. Black & white: Contains 8 different presets. Atmospheres: Contains 8 artistic effect presets to lend a particular atmosphere to your images. Single-shot HDR: Contains 4 presets designed to take advantage of the entire tonal range in an image, without it being necessary to blend together several different shots of the same scene taken at different exposures. Smartphones: Contains noise corrections specific to certain Nokia models that produce RAW files. 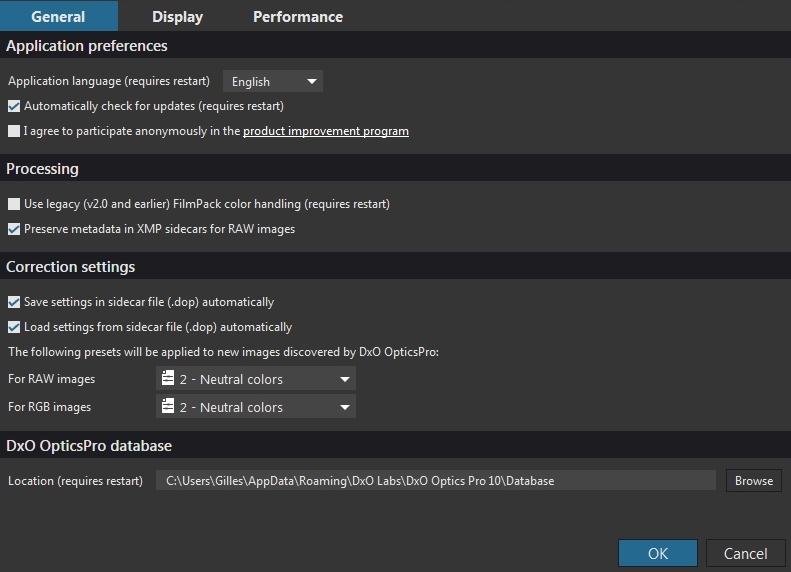 DxO FilmPack Designer (color and black & white): Contains DxO FilmPack Designer renderings, if installed. Of course, if you create custom folders and presets, these will also appear in a visual form in the floating window. Step 1: Open the folder containing the images. In the Source browser, open the folder containing the images to process. They will then appear in the Image browser. Step 2: Select the images to correct and apply a preset. In the Image browser, select the photos that you want to process. Then click on the Apply preset button. The floating window appears and you can then choose the preset that you want. Click on the preset of your choice. It will be directly applied to the selected images. You can apply a different preset at any time by opening the floating window again and clicking on the thumbnail of the other preset. You can also undo your last action by using the keyboard shortcut Ctrl + Z (PC) or Cmd + Z (MAC). By right-clicking on one or more thumbnails in the Image browser, then by choosing Apply a preset in the context menu. By going to the Image menu and selecting Apply a preset. By choosing a preset in the Presets editor palette in the Custom tab (Elite edition only). None of these three cases makes use of the floating window to select a preset. There are several ways to create a custom preset — for example, from current settings, or from a limited number of corrections (with the aim of creating a partial preset). This method is based on the corrections applied to an image during the course of processing; it’s both easy and user-friendly. Open an image and apply the corrections of your choice: white balance, exposure, noise reduction, contrast, etc. Once you are finished with your corrections, right-click on the thumbnail in the Image browser. In the context menu, choose the option Create preset from current settings. A dialogue box prompts you to enter a name for your preset. Validate by clicking on Save (PC) or on Create (MAC). Your new preset will then be listed in the general Presets section, accessible among the others in the presets floating window. 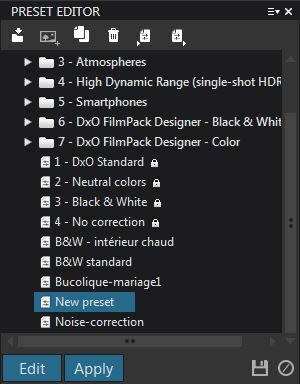 The Presets editor palette (Elite edition) not only lets you create a preset, but also lets you change it, put it in a new folder that will appear as a new section in the floating window, to delete it, and to export it in order to share it. As mentioned above, you can use a partial preset if, for example, you want to apply a limited number of corrections to your images, eventually by combining them with other presets. Repeat the steps in the previous section in order to save your corrections as a preset. 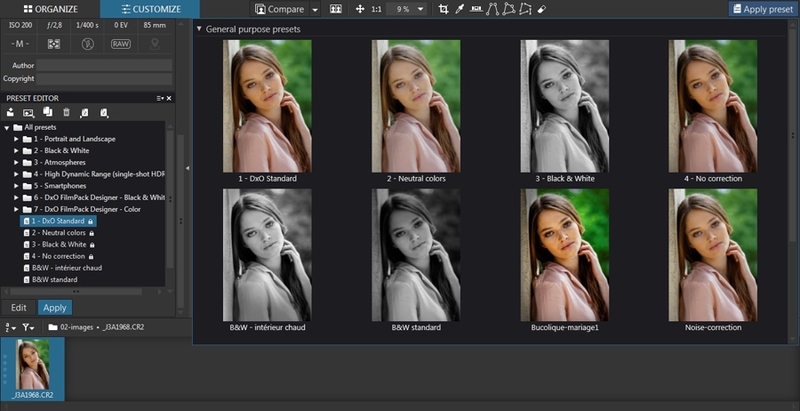 Open the Presets editor palette, select the created preset, and click on the Edit button. The palettes change to edit mode and display switches along a vertical band on the left side of the palettes. The active corrections are indicated in blue, and the inactive corrections are gray (PC) or criss-crossed gray (Mac). You can then disable all the corrections that you do not want to preserve (for example, disable the noise correction if you are applying the preset to images taken at low ISO). After you have defined your active corrections, click on Apply in the Presets editor. 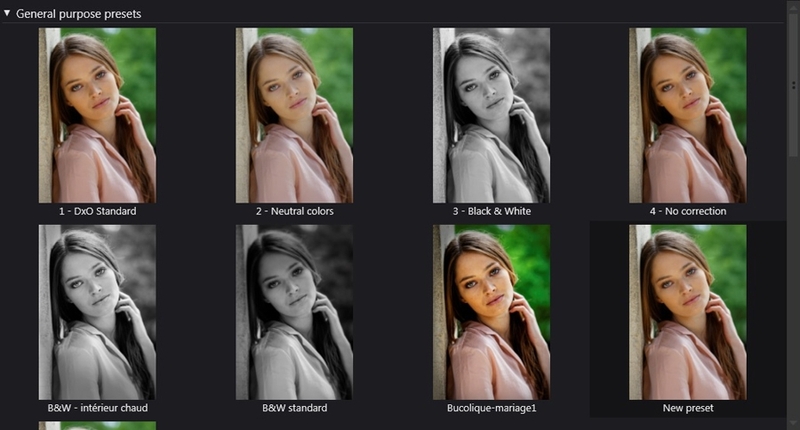 Your partial preset is now available in the presets menu and is ready to apply to your images. 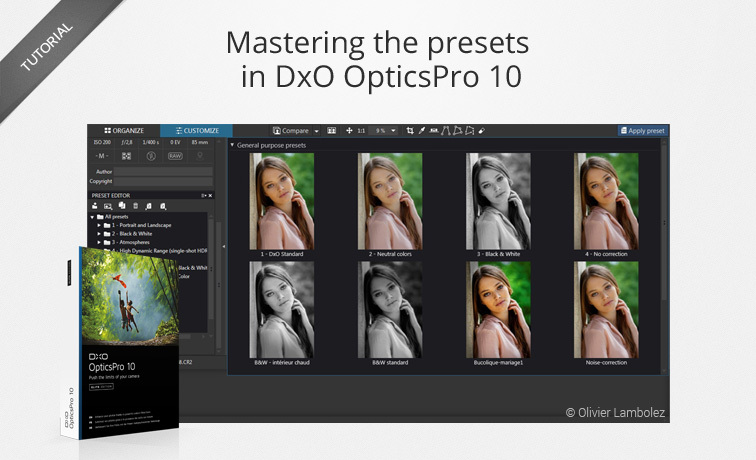 The integrated presets that come with DxO OpticsPro cannot be modified. If you want to create a custom preset based on an integrated preset, you will need to duplicate it in order to modify it. You can replace the DxO Standard default preset, whose corrections are applied when you open a folder of images, with a different preset. The modification of the default preset — that is, if you choose not to keep the DxO Standard preset as the default preset (replacing it with a preset of your choice) — only affects the images that you open for the first time after the change is made. All other images that had already been opened retain their same settings. To open the Preferences window, click on the Edit menu > Preferences (PC) or on DxO OpticsPro 10 > Preferences (MAC). In the Correction parameters (PC) or Default preset (MAC) section of the General tab, two drop-down menus display the preset activated for RAW files and for RGB images (JPEG and TIFF). DxO Standard is the configured default preset. Choose the Neutral Colors preset in the drop-down menu(s) and click on OK.
Of course, you can choose whatever preset you would like to be the default preset. However, even though the corrections are reversible, we advise you against using an artistic preset as the default. Open all of your images with the DxO Standard or Neutral Colors preset, for example, and use the creative presets on a case-by-case basis.